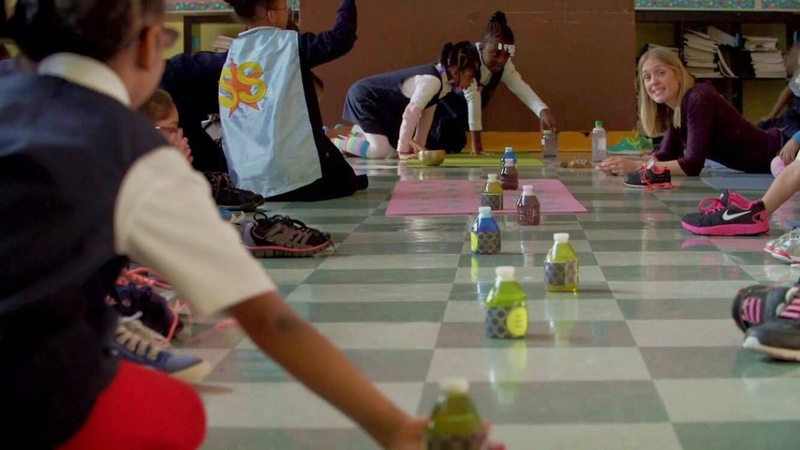 Kelli Love is a full-time yoga instructor at Girls Prep Bronx Elementary, a charter school in New York City where mindfulness is embraced as a school-wide content area. Ms. Love is a strong supporter of organizations that bring yoga to underserved populations and is an active board member of Yoga Within Reach, a non-profit serving communities in NYC. She is currently partnering with Columbia University's Neurocognition of Language lab to collect data to measure the effectiveness of mindfulness training for young children. 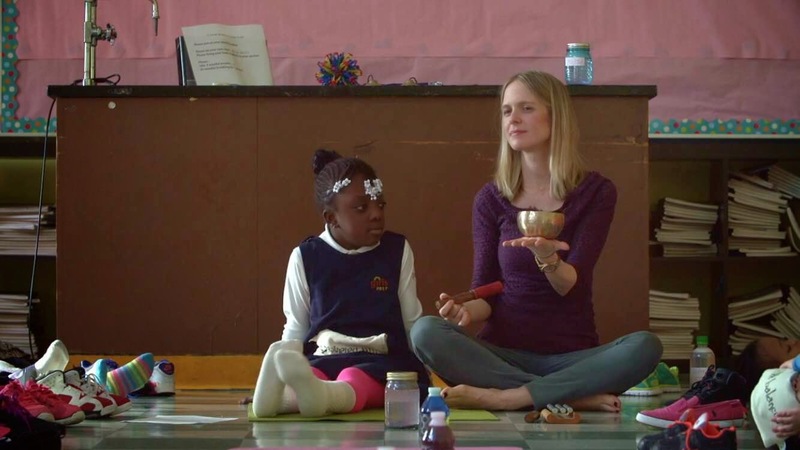 Ms. Love is featured in Aliza and the Mind Jar, a short film that was recently created to show the impact school-based yoga and mindfulness programs can have on families. What are the most effective activities for teaching yoga and mindfulness to elementary school children, and how much time do you spend on each activity? One of the most effective things we can do is use rituals and routines as the foundation of our class structure. It’s as true when teaching mindfulness as it is when teaching any other subject to our kids. Choose a specific way to say hello and good-bye at the beginning and end of a class. Students thrive off of knowing what is coming; creativity can grow out of the safety. Once the routine is established, I add variations and let students choose and ultimately lead the rituals and routines of our class. For example, we practice mindful breathing with a singing bowl at the beginning of each class. It’s our core mindfulness practice and there are so many ways I can scaffold up or down for various age groups. With kindergartners or 1st graders I might spend anywhere from 3 breaths to 3 minutes on this practice depending on the day or their experience level. Another function of the routine is that it builds stamina, wisdom and fluency. At the beginning of the year a 6-year-old student might have difficulty resisting opening their eyes when hearing a sound such as another student sneezing or laughing, but by the end of the year the same student might be working on labeling body sensations or even labeling past and present thoughts! However, it’s not so much which specific mindfulness based activity you do as the teacher, but the way you do it. This comes back to the personal practice and embodied teaching components. The “what” of teaching mindfulness is the least important of the triad (curriculum, personal practice, embodied teaching), which is why someone could be teaching about zebras mindfully and their students might get more out of it than if they were teaching about gratitude in a reactive way. I see the curriculum or activities as secondary to building a personal practice and examining the way one’s own personal practice shows up in the classroom. How do you balance the needs of different students in a group (in terms of physical ability, attention span, etc.)? I have high expectations for all of my students, meaning I examine my own beliefs about what students can do and hold them to their highest ability. This belief is the foundation for all of my interactions with them. Part of my practice is keeping myself in check – making sure my own mindset is not getting in the way. Having said that, fair is also not equal. Knowing my students is paramount when making a decision about how to be responsive to their needs. 1. I remember that my field is in the context of many other fields (Social Workers, Occupational Therapists, Psychologists, Special Education, Speech Therapists etc.) and consult with these professionals who are in my building. I am among a team and while mindfulness does facilitate attention and self-regulation skills, I also keep in mind that I am among other experts who have knowledge not only in these fields, but also about the lives of my students. 2. I create a specific place where students can take time away from the group to self-regulate. I am lucky enough to work at a school where each classroom has a reflection area, also known as a “calm down” area or “peace corner.” It’s part of our school culture and something that I teach in the first week of school. I ensure that students know that the ultimate goal is for them to choose to go to our reflection area in the yoga room if they need a moment alone, although I may give them a gentle nudge if I see that it might be a good idea. We have a bin where kids can use self-regulation tools like the stress ball, glitter bottle, a mirror, or other sensory objects like a soft blanket. Flash cards for various emotions are great to have here too. 3. I always offer a choice when teaching, especially for challenging yoga poses, and often model what might be perceived as the less challenging of the versions. I tell students that to honor their bodies right now in this moment is more advanced than to struggle in an unstable posture that they think looks like what someone else is doing, or even what they were able to do yesterday. There is enough pressure and anxiety in the modern school culture as it is. I’m trying to help my students move away from unnecessary comparison to their peers, and more importantly I’m trying to get them to experience joy in their own bodies. 4. Knowing each of my students individually builds an atmosphere of emotional safety and a culture of acceptance. The container I build allows for difference to live in a friendly environment. My students know that we are working with life skills (focus, self-regulation) and attitudes (gratitude, compassion) in the yoga room, rather than achieving something that looks one particular way. What are some ways parents and teachers can work together in sharing yoga and mindfulness practices with their children? I think eating mindfully is a great way to experience mindfulness in a community. It’s one of the most satisfying ways to transfer mindfulness practice to everyday life…and it’s fun! Since mindfulness simply means doing something in a deliberate, purposeful way, mindful eating might simply offer a quiet time during eating with the framework for noticing the five senses. This could be done at snack time. I find that my students love having a discussion about mindful eating after we practice it. I also find that my students love to bring mindful eating home after we practice it at school. I would also suggest teachers and families take a few mindful breaths together (I recommend starting with three breaths) as an opening or closing ritual to the day. This could be during bed time at home or during a morning meeting at school. This mindful breathing ritual is one way to build a reference for the life skill it becomes during challenging moments. These small moments of awareness are the building blocks for automaticity. Since most schools don't have a full-time yoga teacher, what are the pros and cons of classroom teachers leading yoga and mindfulness activities? There are no cons to classroom teachers leading mindfulness activities! That is to say, with the one caveat that teachers cultivate a personal practice while doing so, even for 5 minutes a day. I have found that the classroom teachers at my school who offer mindfulness independent from my instruction in the yoga room add a strong support to the work I’m doing with my students. It adds enthusiasm, relevance, and a sense of pervasiveness in the life skills that are being targeted. When classroom teachers are teaching these attention and self-regulation skills, as well as someone in my role providing a school-wide curriculum, there is a school culture that is being developed. It makes the learning more powerful. On the other hand, without the classroom teachers integrating these practices into their teaching, the curriculum is taught more in isolation. I am giving students whole blocks of time (40-50 minute classes) to study yoga and mindfulness as a content area within the school day. A classroom teacher might support that by integrating it into their day during routines and transitions. One way that I have supported this is by modeling mindfulness lessons in classrooms during morning meeting so that classroom teachers can utilize the same vocabulary we use in the yoga room. When teachers are using the language along with specific instruction and then families reinforce the learning at home, we are changing the world! Teaching mindfully means that we make a commitment to check in with our inner experience so that we can make a choice to regulate our responses to what is happening in the classroom from a place of self-awareness. On purpose, we are cultivating a particular kind of presence for our students because we know they are counting on us to be a stabilizing force for them. We are in tune with our body, thoughts, and emotions. Mindful teaching also means that we are attuned to our interpersonal relationships with our students. We are sensing the larger pulse of the classroom and making adjustments where needed. It’s a continuous flow of deliberate choice between an awareness of our own experience and the group dynamic so that we are attuned to each other. From this mindful lens, a sense of safety is established and learning can take place. There are so many layers of my teaching practice that are fed by my personal practice. Firstly, my personal mindfulness practice is the cornerstone of teaching from the mindful perspective. I take time to sit and practice mindfulness meditation every day before I leave my home. I think it’s our responsibility to cultivate a relationship to our personal practice so that we can bring a wealth of wisdom to our students. This is a kind of wisdom that only stems from our own practice, not book knowledge. As adults, with a fully developed brain, we have the opportunity to teach from the deep end of the pool, whereas children with developing brains are experimenting with the benefits mindfulness practice brings, such as impulse control. I also commit to a slow, mindful yoga practice. Many media messages about yoga in our culture convey that yoga is something that sculpts our body and not our sense of well-being. I am careful that my messaging to students comes from a practice that is steeped in an attitude of acceptance and non-achieving. I’d like to add that a classroom of children is inherently unstable left on its own and as the teacher we are the container. I love how Tish Jennings, in her book Mindfulness for Teachers, describes one of the greatest challenges of teaching as not being able to leave the room. There is no doubt that emotions will arise in both the teacher and children in a classroom; we need a personal practice to draw on and inform these moments. I tell my students that the reason we sit and practice mindful breathing in the yoga room is that the research has shown that when a strong emotion arises, mindfulness can only help us manage it if we have a reference from using mindfulness in a calm (or regulated) state. Further, without a regular personal practice, formal or informal, I wouldn’t be able to relate to my students and their struggles that arise during the practice. Anyone can teach a mindfulness-based curriculum, but not everyone can teach it mindfully. In this way, my personal practice is intimately informing my instruction with my students. Having said all of this, my personal practice manifests as another final layer, which is the act of self-care. Teaching children is demanding and while I do have a formal sitting and yoga practice, my personal mindfulness practice also takes the shape of me taking care of myself by noticing my needs – whether that be drinking enough water or doing whatever I need to do to deactivate my system and release tension from the day. Teachers are notorious for not taking care of themselves, but when I neglect my own needs, I don’t feel ready to teach at all. Thanks so much for your comment, Caleb! It sounds like you're really thinking through the best way to work with your colleague's daughter--I'm sure she'll get a lot of benefit from your teaching. Hi Caleb. Yes! I've found that the practices that we do regularly as a part of our routine stick with my students the most. Kids appreciate knowing what to expect and those routines will be what they will fall back on when they need the practices the most. Best of luck with your teaching!